At Bloomfield Dental, the wellbeing of patients is of the utmost importance. Bloomfield Dental Center is committed to providing patients with a comfortable environment. Bloomfield Dental’s office is equipped with state of the art technology. Being in business for 25 years, Bloomfield Dental is well trained in all dental procedures, specializing in Orthodontics, Endodontics, Implant Dentistry, and Oral Surgery. In addition to these specialties, Bloomfield Dental provides cosmetic dentistry, achieving impressive results in diagnosing, utilizing treatment plans, and restoring full-mouth reconstruction cases. Bloomfield Dental is also a firm believer of conservative restorative dentistry with minimal invasive care. Bloomfield Dental Center proudly serves the city of Cerritos and Orange County. Bloomfield Dental Center utilizes state-of-the-art technology to enhance dental and treatment experience. Bloomfield Dental is dedicated in providing the most up to date General, Orthodontic, Endodontic, Implants and Family dentistry. Bloomfield Dental has grown to provide a world class facility for the treatment of tooth loss, dental cosmetics and advanced restorative dentistry. Bloomfield Dental is dedicated to the community of Cerritos and Orange County, as well as all other surrounding cities in Los Angeles. At Bloomfield Dental, diagnosing a dental or oral problem is done through state-of-the-art technology such as, low radiation digital X-rays, intraoral photography and digital imaging, dental moicroscope, visual magnification and oral cancer screening. For 25 years, Bloomfield Dental has been a preeminent provider for dental healthcare in all of Cerritos and surrounding cities. Bloomfield Dental accepts late appointments up to 7:00 p.m. 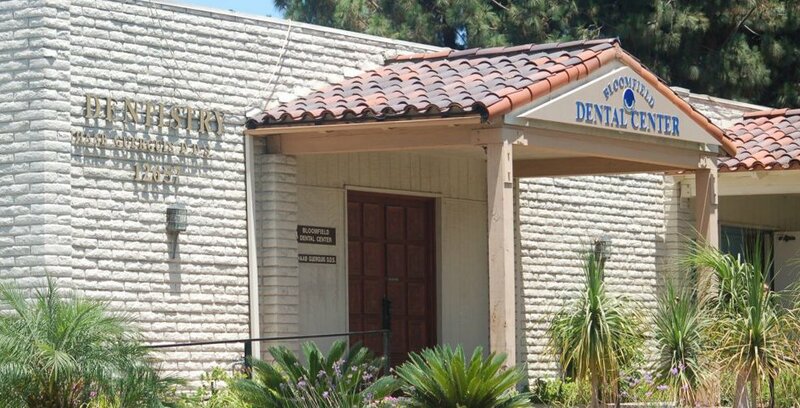 The community of Cerritos is proud that Bloomfield Dental is their preeminent dental provider. Bloomfield Dental is the best in Cerritos, offering a wide variety of dental procedures. Bloomfield Dental accepts all types of payments, from credit to cash or check. Just ask one of our friendly office assistants on payment methods. The city of Cerritos is proud that Bloomfield Dental has served their community for the past 25 years. Bloomfield Dental is by far, one of the best dental offices in Southern California. 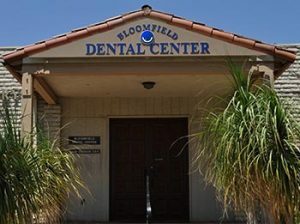 Serving the city of Cerritos for almost three decades, Bloomfield Dental is the preeminent provider of dental care in the region. Bloomfield Dental is dedicated to the community of Cerritos and serves its people proudly. Dentistry can be explained as a branch of medicine that consists of examining and diagnosing a patient to provide prevention and treatment of oral conditions and diseases. Often, dentistry is correlated with teeth, but dentistry includes a far wider variety of oral cavity disorders. Dental science is very critical to a person’s overall health and well-being. A dental team usually consists of the head dentist as well as dental assistants, hygienists and dental technicians. The goal of all dental treatments is to prevent tooth decay and periodontal disease (gum disease). Dentists often restore and extract teeth, to prevent long term damage to the oral cavity. These treatments include root planning and endodontic root canal treatment. 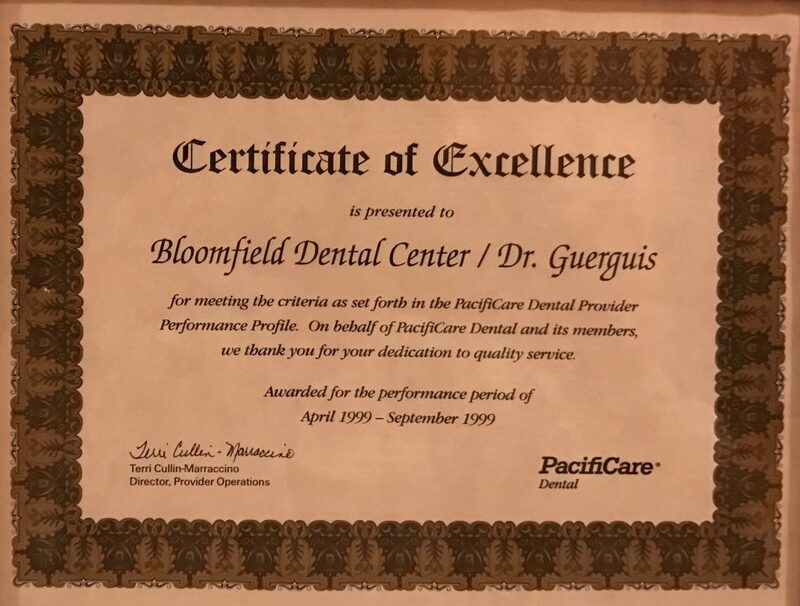 Bloomfield Dental has served the city of Cerritos since 1977, with Dr. Guergues as head of management since 1998. Bloomfield Dental has seven operating rooms equipped with state-of-the-art technology. Bloomfield Dental is a beautiful building that was remodeled four years ago. Equipped with new equipment and dental chairs, Bloomfield Dental is determined in providing top-notch care for all patients. All of Bloomfield Dental’s infrastructure is digital, leaving no room for error and providing patients with the best care possible that is one of the reasons we are top dentist in cerritos. All our rooms at Bloomfield Dental are equipped with television sets, so that the patient experience can be smooth as possible. At Bloomfield Dental, we provide a wide variety of dental services so that our patients can leave completely satisfied. Dental School prepares all dentists to treat most all dental problems. Dentists are trained to carry out treatments such as restorative (fillings, crowns, bridges), prosthetic (dentures), endodontic (root canal) therapy, periodontal (gum) therapy, and extraction of teeth, as well as performing examinations, radiographs (x-rays) and diagnosis. Dental responsibilities include, but are not limited to, diagnosing oral diseases, promoting oral health and disease prevention, examining x-rays, providing safe administration of anesthetics, creating treatment plans and performing surgical procedures on the teeth, bones and soft tissue of mouth. Dentists area of expertise are not only for teeth and gums but all muscles of the head, neck and jaw, as well as the tongue, salivary glands, nervous system of the head and neck and other areas. Dentists are trained to also look for lumps, swellings, discolorations, ulcers or any abnormalities. In many cases, biopsies, diagnostic tests and screening tests must be conducted to gain a better overview of patient’s current condition. It’s very important not to ignore dental problems as it can jeopardize your hygiene and health. If ignored, dental negligence can lead to a slew of problems. Some of these problems include halitosis, bleeding gums, enamel erosion, toothaches, dry mouth, loss of teeth, mouth sores and burning sensations. Halitosis is the clinical term for bad breath. About 90 percent of the time, the source of halitosis is the mouth itself. Halitosis is caused by a biofilm of bacteria in your mouth, usually underneath the tongue. Halitosis is often an early sign of gum disease. If the halitosis continues, it’s important you contact Bloomfield Dental to prevent this from turning into gum disease. Are your gums bleeding? Bleeding gums are one of the first signs of gum disease. The swelling of the gums is usually due to a buildup of plaque on your teeth. Gingivitis is a very common oral problem, but if not taken care of, can eventually turn into a more serious form of gum disease. Bloomfield Dental will fix this problem for you, but you better call us soon as foregoing the problem will make you more susceptible to more advanced stages of gum disease. 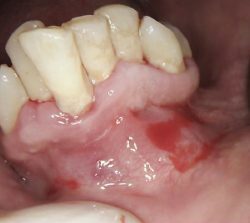 Bleeding gums can also be a consequence of periodontitis, the inflammatory disease of the gums. It’s very important that you contact Bloomfield Dental immediately to treat periodontitis as it can lead to the loss of bone tissue around the teeth. This can eventually lead to total teeth loss. Another very common problem we treat at Bloomfield Dental is enamel erosion. Enamel erosion takes place when acids secreted by bacteria in the mouth eat away at your enamel, making you far more inclined to get cavities and other problems. If left untreated, this process of enamel erosion can destroy all your teeth. That’s why it’s important that you schedule an appointment with Bloomfield Dental so that we can fill these cavities and educate you on preventative measures when dealing with dental hygiene. Toothaches are another common problem amongst patients with advanced tooth decay. Whatever the cause of the toothache, it’s important that you contact Bloomfield Dental so that we can diagnose your current dental situation. If left untreated for long periods, gum disease can cause direct tooth loss. Bloomfield Dental is dedicated in preventing any form of tooth loss by first diagnosing the problem, and then coming up with a detailed plan for treatment. Bloomfield Dental has been the leading dental group in all of Cerritos for the past 25 years. Bloomfield Dental is considered one of the best practices in the city of Cerritos and as a result, has provided top-notch care for the past 25 years. With over 24 years of dental experience and experience with implants, we are experts in all facets of dentistry. 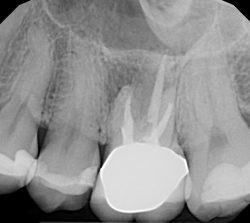 The patient presented to our office, Bloomfield Dental Center in Cerritos, seeking Dental Treatment for the Lower Right Molar tooth # 31. 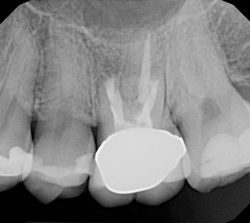 After examining the tooth Clinically & Radiographically, presented to patient different restoration options. Patient chose the Full Porcelain Onlay, which is more conservative than full coverage crowns and is the option of choice in this case. 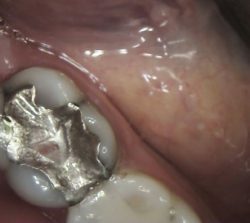 All the Silver (Amalgam) filling & recurrent decay was removed, tooth was shaped & an impression of the tooth was taken, sent to the Lab for fabrication of the Porcelain Onlay. The following visit the Porcelain Onlay was fitted, patient approved it, an X-Ray was taken before final cementation, occlusion checked then the Onlay was permanently cemented. Patient was happy & impressed with the final outcome. The patient presented to our office, Bloomfield Dental Center in Cerritos, seeking Cosmetic Dental Treatment for the 2 Lower Right Premolars # 28 & # 29. 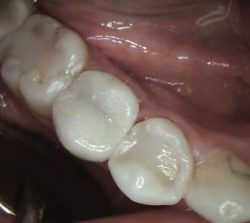 Both teeth had very old tarnished, leaking, dark black Silver (Amalgam) filling with Recurrent Decay under the fillings. 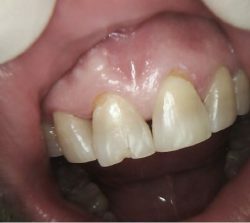 Patient was looking for a Cosmetic Restoration for both teeth. After giving patient different restoration options, patient decided to have the Cosmetic filling (Tooth Colored Filling) on tooth # 28 & the Cosmetic Full Porcelain Crown on # 29. All the Silver (Amalgam) filling & recurrent decay was removed, teeth was shaped & an impression of the teeth was taken, sent to the Lab for fabrication of the Porcelain Onlay & the Full Porcelain Crown (Cap). The following visit the Porcelain Onlay & the Full Porcelain Crown were fitted, patient approved them, an X-Ray was taken before final cementation, occlusion checked then the Porcelain Onlay & the Full Porcelain Crown were permanently cemented. After both Restorations were placed, patient was very impressed & happy with the outcome. Patient came to Bloomfield Dental Center seeking major help with her teeth. 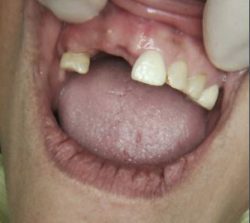 Patient presented with number of missing teeth and badly abraded teeth. Patient wanted a new mouth. We started by Deep Cleaning the teeth (the foundation), extracting all broken & un-restorable teeth, buildup broken teeth & restorations. Then we prepared the teeth and took impressions for Full Arch Porcelain Cosmetic Bridges. Temporary crowns were placed until the Porcelain Cosmetic Bridges arrive from the lab. 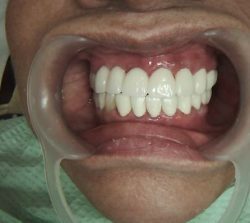 The Porcelain Cosmetic Bridges are placed in the patient's mouth, to check the look, the bite, then X-Rays are taken to how they fit on the teeth. If everything looks good and patient likes the Porcelain Cosmetic Bridges in their mouth, we cement the Bridges permanently. 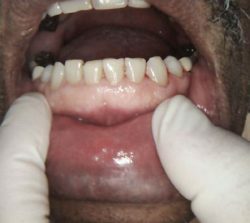 The patient presented to the office with crowded Lower Anterior Teeth creating gum diseease & poor oral hygien. The Lower 4 middle teeth were extracted in one visit. 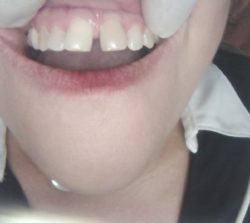 Patient wear a temproray removable appliance replacing the 4 extracted teeth fo 4-6 weeks, for healing. The following visit the two teeth on the sides (the lower canines) were prepared and impression was taken and sent to the lab for the Cosmatic Porcelain Bridge to be fabricated. 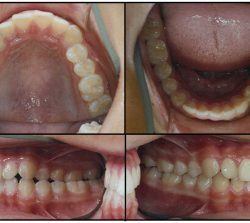 Two weeks later the 6 unit Bridge was cemented permenantly in patient's mouth. 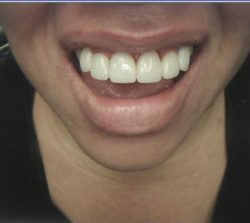 The placement of this Bridge changed completely the cosmatic appearance of the patient improved her Oral Hygien by 100%. 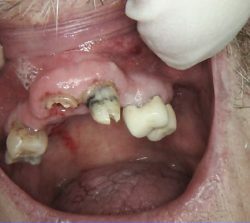 The patient presented to the office with a Removable Partial Upper Denture replacing 50% of his Natural Teeth, causing the patient continuous discomfort, gum inflammation from food accumulating under Partial Denture, also Tooth looseness from the continuous movement of the Partial denture while eating. A Full Arch Reconstrution was started, involving needed treatment and building up of some teeth to be able to support the Long Span Bridge. 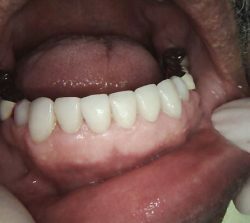 A 12 unit Fixed Bridge was cemented permenantly in patient's mouth replacing the removable partial denture. 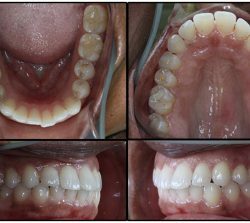 The New Fixed Bridge, tremendously improved patient's cosmatic appearance, Oral Hygien and gum condition. Ability of chewing food inproved by 100%. 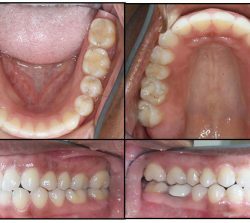 The Full Upper Arch Reconstruction from start to finish took 10 weeks.The outcome was extremly impressive. Patient presented to our office, Bloomfield Dental Center, with the Lower Front 6 teeth (Lower 6 Anterior Incisors) very short as a result of severe teeth attrition. After examining the teeth Clinically, Radiographic X-Rays & Intra-Oral Photographs, had a consultation with the patient explaining in detail the teeth condition & different options of treatment. 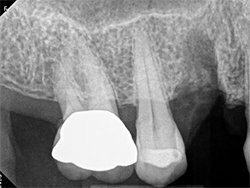 The treatment of choice for this case was Full Coverage; Crowns. 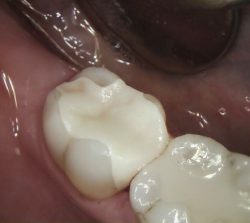 Patient agreed to have 6 Full Porcelain Esthetic Crowns. After numbing the patient, the 6 Lower Anterior Incisors; #22,#23,#24,#25,#26, & #27 were reduced all around to have the Crowns cemented on top to completely cover each tooth. An Impression is taken, the Crowns Shade is selected and sent to the Lab for fabrication of the 6 Full Porcelain Esthetic Crowns. Provisionals (temporary crowns) are placed till next visit when the Permanent Full Porcelain Esthetic Crowns are tried in for fit. X-Ray is taken to check fitting of the Crowns on the teeth. If Fit is acceptable, the Crowns are cemented on the teeth permanently. 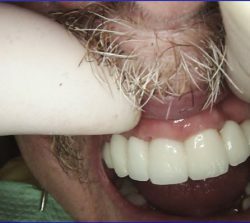 Excess cement is removed & occlusion is adjusted to a comfortable bite. Then the Full Porcelain Esthetic Crowns are finished & Polished. 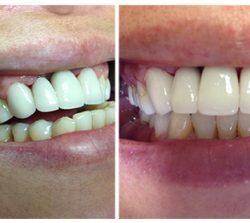 The After Picture is the final product of the 6 Anterior Full Porcelain Esthetic Crowns. 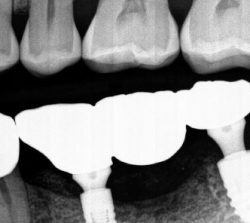 This is a case of a 50 year old, that needed to replace a broken bridge in 2010, after careful evaluation and examination, it was determined that the bridge will be removed and replaced by two implants. The implants were placed, a ridge augmentation procedure was done, patient was given written post operative instructions and she left in good condition and spirit. After 3 months, the implants were exposed, abutments were placed and new Zarconia crowns made, Patient kept coming back for routine hygiene, she is still till today enjoying her new front teeth. Patient came in with pain, discomfort, swelling and gingivitis around 18,19,20 and 21, after careful evaluation , a CBCT scan was ordered, patient then came back for surgery, the failed endo on 18,19, failed bridge and #20 were all surgically removed, mineralized cortical Allograft mixed with local antibiotics was placed for ultimate healing. The patient came back in 3 months and two ankylos implants were placed. After 3 months implants were exposed, healing abutments placed followed by permanent abutments and impression for a Zarconia bridge. bridge was then cemented, and patient was very happy. Patient had tooth #5 extracted due to failed endo, mineralized cortical allograft with Implant was placed immediately, After 4 months when healing was completed, an abutment was placed and impression was taken, two weeks later a zirconia crown was cemented and patient was very happy. 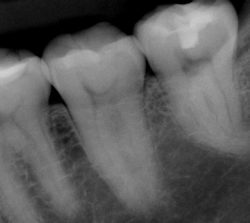 Patient came in with severe swelling and pain on 18 and 19, after careful examination it was determined that 19 is fractured and 18 have severe and advanced periodontitis. The decision was made to surgically extract both teeth, clean irrigate, medicate the sockets and augment the ridge with mineralized allograft 8o% cortical and 20% cancellous. CBCT scan was ordered, and surgery was successfully completed. Three months after healing, two Ankylos implants were placed and covered by a healing caps. 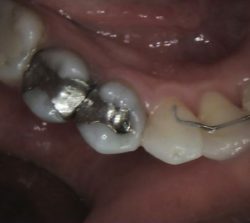 Patient came back in 3 months for abutment placements, impressions were taken, and two weeks later, porcelain fused to gold crowns were cemented on. 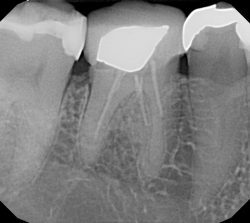 33 year old female with swelling and pain to chewing in the upper left despite root canal retreatment. Apical surgery, bone grafting, and biopsy were performed on tooth #14. 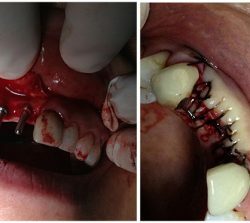 The patient's chronic apical abscess completely resolved, her pain is gone, and she is able to chew normally again. 48 year old female with spontaneous severe dull pain especially to cold, hot, and sweets for several weeks, increasing intensity and frequency in the past week after treatment for a deep cavity. Tooth #17 had a deep filling and extremely curved roots. 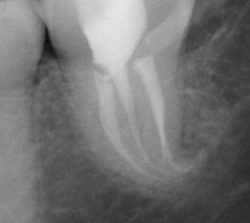 Root canal treatment was performed, and the patient's pain went away. 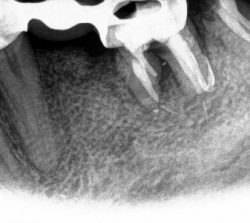 45 year old male planning a new crown on tooth #30 due to a new deep cavity. The original root canal treatment was done 20 years ago. 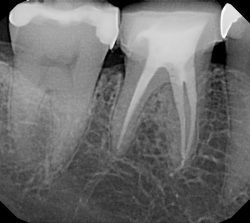 The root fillings are short, and the canals are blocked. Retreatment of tooth #19 was done to prior to crown replacement. Using a microscope and specialized tools, we were able to clean all the way down the root. 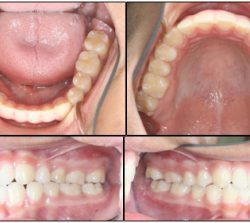 Option 1: Ortho Treatment (having Braces) to close the space and then Teeth Whitening after completion of Ortho treatment. Option 2: Placement of 6 Porcelain Veneers. Patient was given time to decide on which option would be patient’s choice. On the next visit, patient decided to go for the 2nd Option; Porcelain Veneers. Teeth were minimally reduced, impression taken & sent to the Lad for fabrication of the 6 Porcelain Veneers. The following visit, the 6 Porcelain Veneers were cemented on the 6 Anterior teeth with a bonding, Light Cured cement. Then the Veneers are finished & polished. The final product is the After Picture. Porcelain Veneers; are replica of Ideal Natural Teeth. 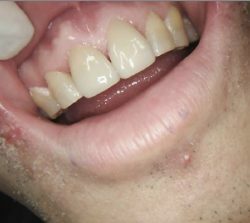 Patient presented to Bloomfield Dental Center seeking treatment for his 2 Front teeth (Central Incisors #8 & #9). 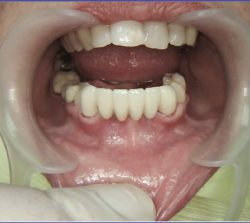 After examining the teeth Clinically, reviewing the X-Rays & Intra-oral Photographs, both teeth revealed; Attrition (wearing off of the enamel surface) & Teeth Chipping due to teeth thinning as a result of attrition. Patient was informed about the teeth condition and the treatment of choice; which is Porcelain Veneers. Porcelain Veneers; are porcelain facings (they are not crowns) mainly performed on Anterior teeth and they are more conservative (less tooth reduction) than Crowns. We minimally reduce the front surface(Facial), the Incisal 1/3 of the inside surface (Lingual) & minimally shorten the tooth, then an impression is taken and sent to the Lab for fabrication of the Porcelain Veneer. In most cases, there is no need to place provessionals due to minimum reduction. Another appointment is reserved for the patient, to place the Porcelain Veneers. The Veneers are cemented on the teeth by a bonding cement, then finished & polished. The Veneers are replica of Ideal Natural teeth. I just came back from Bloomfield dental center. Doctor Guerguis and his staff were great, friendly and awesome customer service. I won’t hesitate to go back again for all dental procedures and I recommend it for everyone. Best dental practice I’ve ever been to! Dr Guerguis (dentist), Dr Angelici (orthodontist) and his office staff are very gentle, kind, knowledgeable, and friendly. Thank you for 3 years of great service. Nice office, nicer staff. I have been going to Bloomfield Dental for many years and I have recommended them several times. Conveniently located, plenty of parking and an experienced dentist that explains the cost for procedures up front & honestly. Open late on Tues & Wed, which is a plus. Bloomfield Dental Center, where he’s been serving the Cerritos community since then. Dr. Guerguis is a firm believer in continuing education and has completed well over 600 C.E. 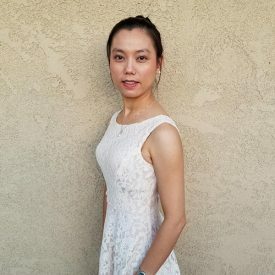 hours on a variety of dental topics, including contemporary techniques and advancements focusing on cosmetic and modern restorative care. 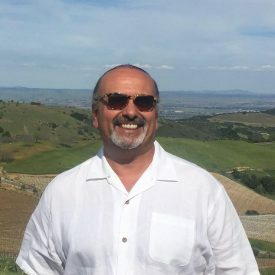 His 30 years with dentistry trained him well in all dental procedures, but he believes in specialization, so he characterizes his practice with a variety of dental specialists for Orthodontics, Endodontics, Implant Dentistry, and Oral Surgery. 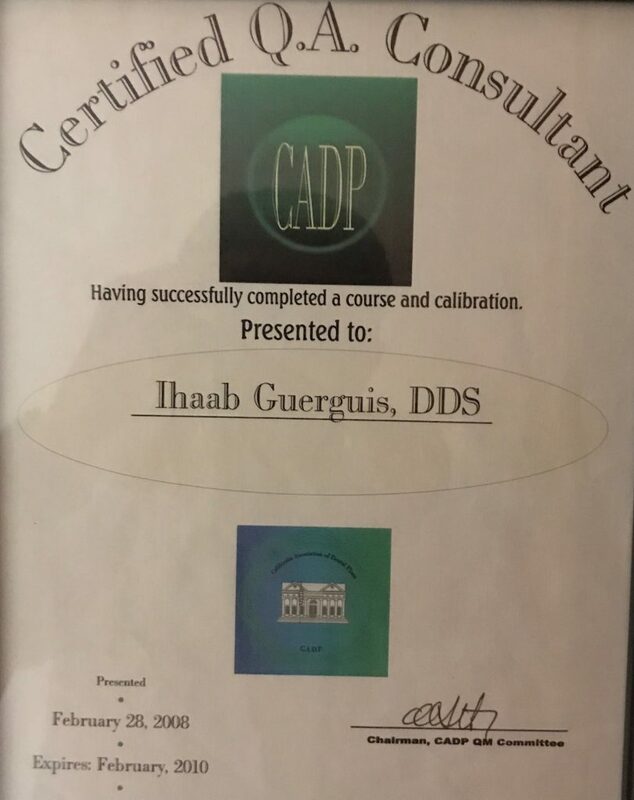 Dr. Guerguis has an eye for cosmetic dentistry; he achieves impressive results in diagnosing, treatment planning, restoring full mouth reconstruction cases, and transforming hiding smiles into attractive smiles. He is also a firm believer in conservative restorative dentistry with minimally invasive care. Outside the office, Dr. Guerguis loves traveling and learning about different cultures. He enjoys family time and outdoors activities, especially playing soccer with his son, biking, fishing, and skiing..
Dr. Fahmy attended the prestigious School of Dentistry at McGill University in Canada and the UCLA School of Dentistry. 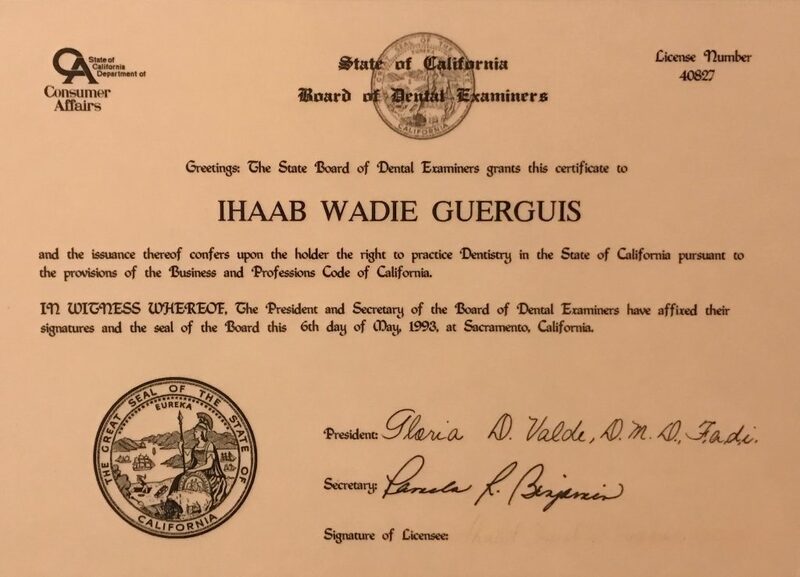 He obtained certification in dental implantology through The Scripps Research Institute in 1990 and has been placing and restoring implants ever since. 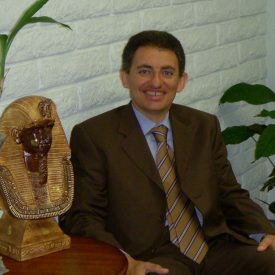 Dr. Fahmy is a Fellow and a Diplomat in Oral Implantology from the International Congress of Oral Implantologists (ICOI). He has participated in numerous national and international conferences on dental implants. Complementing his dental implant practice is his vast experience in oral surgery, impacted teeth extractions, and complicated full mouth reconstruction cases, as well as TMJ and other cosmetic procedures.Dr. 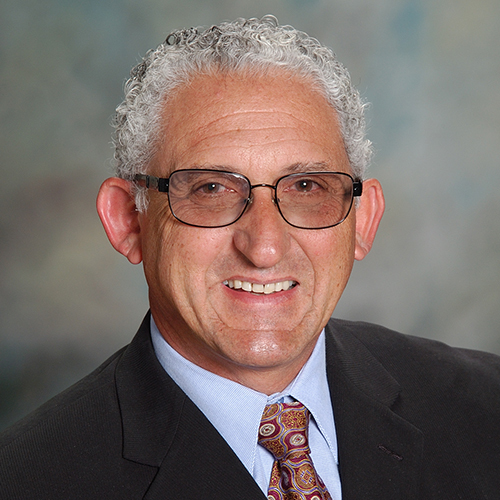 Fahmy is licensed to practice in California and has been serving the local Orange County community since 1985. Dr. Angelici received her Bachelor of Science degree from the University of California, Irvine in 1980. 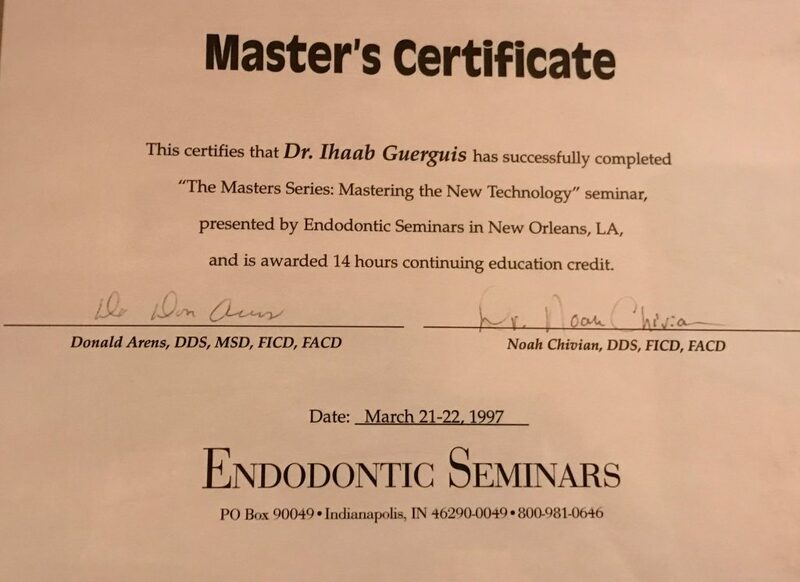 She then attended the University of Pittsburgh School of Dental Medicine (where all the dental-minded members of the Angelici family went), where she graduated from in 1982. She then chose orthodontics as her life’s work and received her Master of Dental Science in 1985. During this period, she was an instructor of orthodontics at the University of Pittsburgh School of Dentistry undergraduate program. She returned to California to take the State Boards and to open her own offices, where she specialized in adult and children’s orthodontics. Because of her love of teaching, Dr. Angelici has been a clinical instructor at UCLA School of Dentistry since 1995. Dr. Angelici volunteers her time and energy to many community projects and is the Orthodontic Advisor for the Assistance League of Long Beach. She has a son named Jay, who hopes to one day carry on the family tradition of joining the Angelici dental/medical team. She is committed to excellence and in striving to be the best that she can be to provide optimal oral health in a caring and gentle manner. In her spare time, she enjoys being with her love ones.